Well hello to you my reader chums! 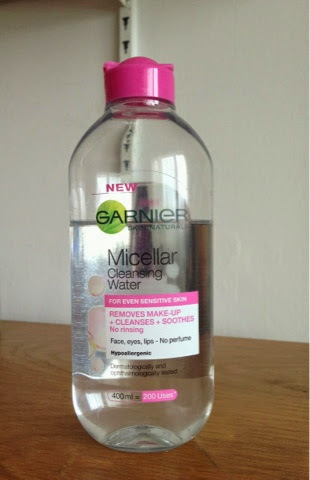 Today I've got a review for you on Garnier's micellar cleansing water. I've been loving this product lately and it's been previously featured in my April favourites. I purchased this over a month ago after reading a couple of blogs of people raving about it and wanted to give it a try myself. Since buying I've used it instead of my usual cleanser in my skincare routine and it works amazingly! 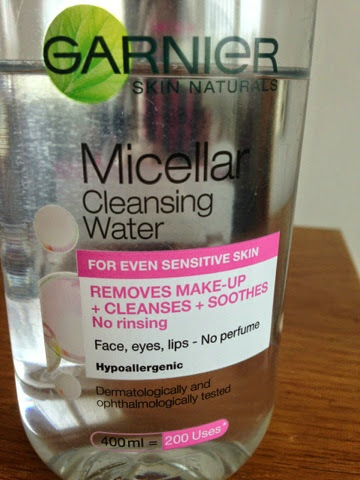 This micellar water easily wipes away makeup, even eye makeup gently with it not being too harsh on the skin. It leaves your face feeling refreshed with all the nasty germs and makeup excess been taken away. I found after using this, my eye lids have become less oily, I'm not sure if its because my other cleanser was making them that way or if this product has soothed them, however I'm extremely pleased with the outcome. I use this day and night and even a little amount of the product goes along way! It claims to have 200 uses, I've had this product for over a month and use it twice a day meaning I've had over 60 uses and I've only used a quarter of the bottle. With that in mind, I reckon it'll give me about the recommended amount. The product has no perfume which is a big advantage because I have sensitive skin. I love this aspect of it because it doesn't feel like its harming my skin. Also it's rather a light product and literally feels like water applied to the skin. With it being water you'd think it would take ages to dry after being applied, however it takes under a minute to dry which is always a bonus! For the first cleansing water I've tested, I'm definitely going to try out more! To sum up: I adore this product, it easily takes off makeup, leaves the skin feeling soothed and clean with it not being too harsh! A must buy in my opinion. I'm still dying to try this! It is a fantastic product, really leaves my skin feeling fresh and clean and not greasy, or oily like some make up removers can do.